Molten rock (magma) is generated in planetary interiors and rises toward the surface, sometimes cooling and freezing before it gets to the surface (forming intrusions), and sometimes continuing to and extruding onto the surface (forming lava flows). On the Earth, a wide variety of intrusions and extrusions occur, and active volcanoes are common, as exemplified by the recent activity at Kilauea volcano, Hawaii. On the Moon, however, active volcanoes have not been detected, and the most recent volcanism is thought to have occurred over a billion years ago! Because of its small size (one-fourth the diameter of Earth), the Moon cooled down much more rapidly than the Earth, and even when volcanism did occur in the past, the magma was generated much deeper and came to the surface much less frequently than on Earth. When eruptions did occur from these great depths (hundreds of kilometers), they were voluminous and reached the surface at high velocity, producing large, flood-scale eruptions. Unlike the Earth, this high volume and high velocity favored extrusion of lava onto the Moon’s surface, rather than intrusion of magma within the crust. But were there any circumstances in which magma intrusion did take place on the Moon? 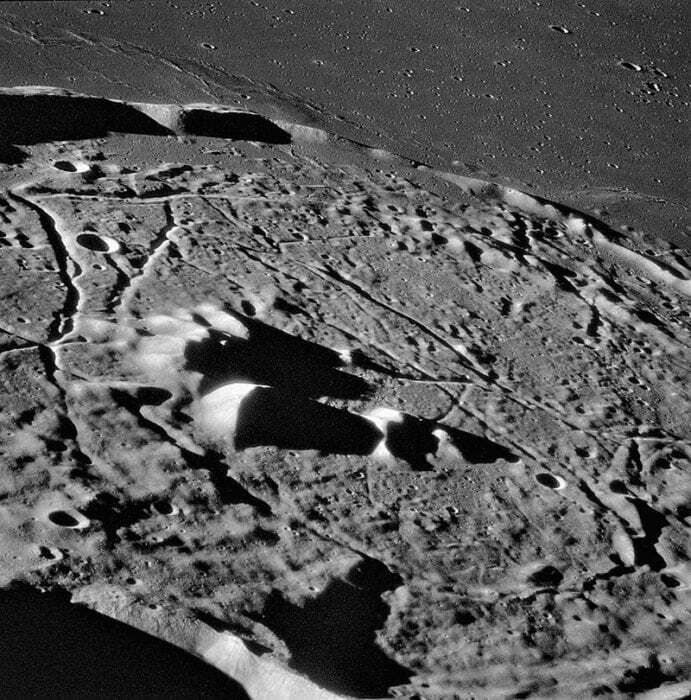 In 1976, Peter Schultz described a class of lunar features called “floor-fractured craters” (FFCs). 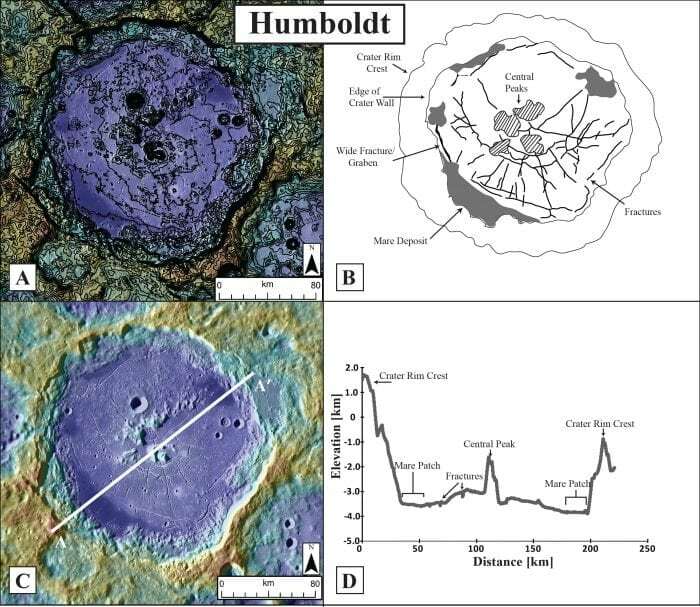 These unusual impact craters had cracked and fractured floors (Figure 1), and the floors were anomalously shallow compared with unfractured impact craters of similar size. Additionally, few FFCs were observed on the lunar farside. Schultz interpreted these FFCs to be the result of the intrusion of magma below the crater floor to form a “sill,” the geological term for a flat tabular magmatic intrusion. Decades later, Lauren Jozwiak was able to use new imaging, topographic, and gravity data to characterize the population of lunar FFCs and show that there was indeed solid evidence that the deformed craters were formed by sill-like magmatic intrusions below the crater floor. Figure 1: The floor of the crater Humboldt. A) A contour map of the crater floor with 100m intervals emphasizes the overall flatness of the crater floor. B) A geologic sketch map of the major morphologic features of the Humboldt floor including the radial and concentric fractures, and the lava (mare) deposits. C) An image of the crater showing the location of the topographic profile in part D. D) Annotated topographic profile across the floor of Humboldt. A) and B) show LOLA 512 px/dg gridded topographic data overlain with LROC-WAC global mosaic image data. But how did this process work? Why did the magma stop and form intrusions here? How did the intrusion deform the crater floor? And why are FFCs so rare on the lunar farside? Lionel Wilson and Jim Head addressed these questions in a paper in the journal Icarus. Recent developments in the knowledge of lunar crustal thickness and density structure have enabled important revisions to models of the generation, ascent, and eruption of magma; additionally, new knowledge about the presence and behavior of gas species trapped in the magma (magmatic volatiles) has provided additional perspective on shallow intrusion processes (like in FFCs). Wilson and Head used these new data to assess the processes that occur during dike and sill emplacement, including focusing on how magmatic volatiles (species like CO and H2O) evolve, migrate, and eventually vent to the surface. They found that FFCs resulted from very specific circumstances: the magma-filled cracks (dikes) transporting magma to the surface must make it close to the surface, but they fail to erupt because of the substructure of the impact craters above. Beneath the impact crater is a heavily fractured region called the breccia lens, and the difference in ductility between this region and the normal lunar crust forms a boundary that stops dike propagation and instead forces lateral spreading. The high magma rise velocity causes the dike tip to overshoot this boundary, and the excess pressure at this interface drives the horizontal flow of magma. This overall process forms the intrusion and raises the overlying crater floor like a piston. The sill stops growing when the internal magma pressure equals the external pressure (the intrusion just supports the weight of the overlying crust). While this mechanical process is occurring, the gas species in the magma are similarly evolving. As the magma in dikes approaches the lunar surface, the pressure from the overlying crust (overburden pressure) continually decreases, and this enhances CO gas formation. The formation of the CO gas further lowers the pressure and leads to the release of H2O and sulfur compounds, also in the form of gas bubbles. Collecting all of this information together, Wilson and Head present a step-by-step sequence for the formation of FFCs (Figure 2): 1) Propagating dike is halted at the breccia lens beneath a crater; 2) Excess pressure in the dike causes the magma to propagate laterally forming a sill, and vertically lifting the crater floor; 3) The uplift of the crater floor causes the surface of the crater floor to fracture. During this stage, small secondary dikes can propagate from the top of the sill to the crater floor, resulting in small eruptions. 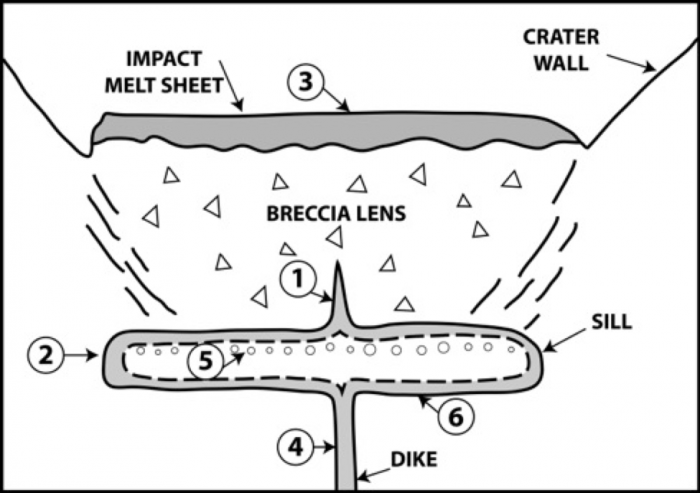 Figure 2: Cross-sectional schematic diagram of the process of intrusion of magma into an impact crater breccia lens to form a floor-fractured crater. (1) Initially, a dike intrudes into the breccia lens below the preexisting crater floor, and slightly overshoots the rheological discontinuity at the base of the ductile breccia lens; (2) excess pressure in the dike causes the sill to then spread laterally and grow vertically, uplifting the crater floor (3), and deforming and fracturing the rigid impact melt sheet lining the crater floor; (4) sill formation and floor uplift continue until the excess pressure in the underlying dike equilibrates; (5) intruded magma in the sill undergoes volatile evolution, causing formation of a foam layer and its collapse; (6) intruded sill magma undergoes final cooling, shrinkage, and subsidence until solidified, resulting in a net subsidence of ∼10%. This initial phase of intrusion, lateral sill spreading, and floor uplift occurs within a few hours after initial dike emplacement. During the subsequent cooling of the sill, gas bubbles can rise hundreds of meters to the top of the intrusion to create a foam layer and subtly thicken the intrusion. Finally, as the magma in the intrusion cools, it contracts, and the entire intrusion shrinks (subsides). Over its history, a sill with an initial thickness of 2 km will form and uplift the floor in a few hours, then gas formation and bubble migration occur over the next decades, and finally, over a century, the intrusion solidifies and subsides to a final thickness of ~1.7 km. This predicted sequence of events is being compared with the sequence of floor deformation and volcanism in FFCs in order to test and refine this model in work led by Jozwiak. These findings are described in the article entitled Lunar floor-fractured craters: Modes of dike and sill emplacement and implications of gas production and intrusion cooling on surface morphology and structure, recently published in the journal Icarus. This and related work was conducted by Lionel Wilson (Lancaster University), James W. Head (Brown University), and Lauren Jozwiak (Johns Hopkins University Applied Physics Laboratory). Lauren Jozwiak. PhD, is a Planetary geologist and Planetary volcanologist at Brown University. Lionel Wilson is a physicist at the Lancaster Environment Center, Lancaster University. James Head is a volcanology and geology researcher at Brown University · Department of Earth, Environmental and Planetary Sciences.